Welcome to part 9 of our Snapchat Influencer Q&A series, where you can learn from the masters as we deconstruct the techniques used by Snapchat influencers. Today, we are talking to Russell Barnard. Russell is an developer and entrepreneur who has co-founded Snappd and host the Story Quest podcast. In this interview Russell talks about why he started Snappd, the future of Snapchat and what you need to do to start and grow your Snapchat audience. Q: Hi Russell, great to meet you. Thanks for taking the time to share you knowledge with us. Could you tell us a bit about yourself and what you do? Russell: Hey Jason, really good to meet you as well. No problem thanks for having me as part of blog! So I am a self-taught developer and I first started learning code and building websites when I was 16. More recently, I have focused on app (iOS) development. My development skills have allowed me to delve into the rollercoaster life of the startup world, firstly with Webfolio but more recently I have co-founded Snappd which is soon to be launched. Q: What is Snappd and what was your inspiration for starting it? Russell: At Snappd our goal is to create the home of vertical video. We allow content creators and influencers from platforms like Snapchat to Instagram to repurpose their past stories and help them to be discovered more easily which will help grow their audience and eventually monetise their content. We came up with the idea after making stories ourselves and watching other valuable content and found that all this effort goes into creating these videos only for it to be lost. We realised that there wasn’t really a place to reupload stories that was focused on mobile. What a lot of creators do is upload stories to youtube but that’s more suited to horizontal videos and without having a large following this content can be difficult to discover. Q: What do you Snap about most on your personal account? Russell: On my Snapchat account I started making stories about development, mostly teaching people how to make small apps and some tips with Swift and iOS development. But more recently I’ve been showing behind the scenes of what it is like to be on an accelerator and the day to day life of running a new startup. 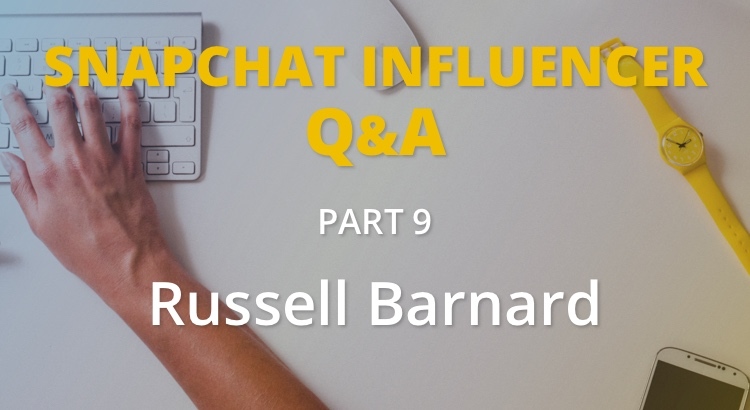 Russell: Ive been a Snapchat user for a while, about two and a half years but I only really started taking it seriously around January 2016 as I noticed that stories had started to become get more and more popular and used by quite influential people providing really valuable content. I think I realised when I started watching Mark Suster’s stories and other interesting people. They were able to grow their following and engage well with their audience and so I thought that this could be a great platform to drive traffic and to try it out myself by providing valuable stories. Q: What effect has Snapchat had on your personal brand? Russell: Using Snapchat regularly and putting effort into my stories has had such a profound effect as before I didn’t really have much of a personal brand. However when I started creating stories it helped me realise what content I should be focusing on and showcasing which I then try to replicate on Twitter and other places so that it’s all consistent. For example I have started to use what I’ve talked about on Snapchat in a Medium post and as LinkedIn articles but it all started with Snapchat as I feel the story format is the best way to create focused and interesting content. Russell: I think it’s a really interesting topic. Snapchat has grown immensely but it has also changed a lot and pivoted slightly from its early days including the addition of the discover section and now with spectacles so it’ll be really interesting to see how it will continue to innovate. In terms of marketing I think that the introduction of third party apps such as Snappd for example can help grow audiences and direct them to certain online businesses or services. I can see this growing over time as Snapchat is one of the best places for audience engagement and more people and brands are beginning to view Snapchat as a marketing tool. Russell: For someone who is just starting out they need to have a clear vision of what kind of content they want to create. For me, to begin with I wanted to specialise in providing development tips and that was what set me apart from other creators as I don’t think anyone else was doing that at the time. That doesn’t mean that shouldn’t create content if someone else is doing something similar as chances are their audience would also be interested in what you have to say about that topic as well. So yeah, the first thing is figuring out what you are good at and how you can bring value to your viewers then just be consistent with it. I think it’s also important to enjoy the process – it does take some time to feel comfortable in front of the camera but once you start to enjoy it you can easily make a story from anywhere and that’s when it becomes really powerful. Russell: Without a doubt I’d have to say my favourite person to follow is Mark Suster, I really like the fact that if you see he has made a story you know it will be quality. His snapstorms always provide great value particularly when it comes to business and fundraising and he uploads each story to his website as well which are great to rewatch. Thank you Russell for taking the time to share your knowledge and opinions. To connect with Russell, scan the snapcode at the top of this article or tweet him. If you enjoyed this interview, please check out more in the Snapchat Influencer series.